Welcome. Bows, sticks out right hand ­- I'm Ben, the Kilted Karateka, striving to improve the learning and teaching of Karate - for the benefit of everyone. Here at The Kilted Karateka you’ll learn ways to level up your Karate practice, and your life; for your benefit and for others. 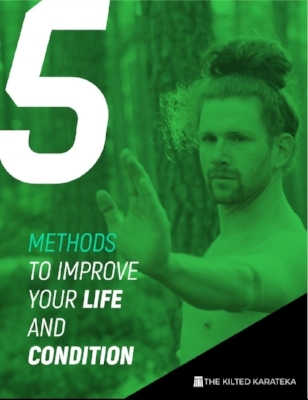 I’ve had over 20 years of instruction in Karate across three continents, as well as instruction from highly regarded teachers in Yoga and weight lifting. I have sought the knowledge to improve my practice, believing that no one person can know all the answers, and we should be in search for everything that can benefit us physically, mentally and spiritually. Being a traditional Karateka doesn't mean blindly following Eastern mysticism or disregarding modern sporting methods. It is about maintaining the principles of the art, whilst applying the latest in scientific sporting methods. Do you want to improve your Karate practice? Training can take a heavy toll on the body. Which is why it's important to do what you can to support it. Get started with this eBook offering you a no nonsense guide to improving and supporting your body for training.